Your media and data are an important part of your business. The files you have on clients, transactions and contracts need to be kept safe from disasters and thieves. There are certain files that you are required to keep a record of by the law. Other files represent years of hard work and research. It can be difficult and overwhelming to manage storing the data. While organizing it in your office can be difficult enough, it is equally important to find a place where you can store your documents off site. The off-site backup will protect your documents in the event of a natural disaster or a fire. Media vault protection can provide the solution that you are looking for to protect your backup files. Media vault protection provides a climate-controlled place to store your media files that is designed to protect your files from all types of disasters. You can store your media on servers or physically store tapes, CDs and other things that you need to have in a climate controlled environment. The media vaults are further protected by securing your materials so that only you and your employees can access them when you need them. This gives your files additional safety from being accessed by others. It is important to securely store your backup files in an off-site location to help protect the data that allows you to operate your business. Disasters do happen occasionally. You may face flooding after a hurricane or damage from a fire. While you may be concerned about rebuilding your office, you can get your business up and running much more quickly by accessing the files that you have secured inside of your media vault. You can choose to rotate tapes, disks or to do an automatic nightly backup to the servers that you have stored in your media vault. It is important to establish a set procedure so that your documents and other files are regularly backed up. You can schedule for your tapes to be picked up each month. This will protect that data. If you are doing online backups, you can schedule them to take place each evening or once a week. You can choose to do this according to the volume of records that you update daily. Organization is an important part of a backup system. You may want to hire someone to manage your files and backup full time. If you are not ready to do that, then a data storage and document company can help you create a system that you can easily update. They can also help you organize your past files and create backups if you have not been doing it on a regular basis. Data backups are one of the lines of defense you need to take to keep your company operating even after a disaster. Media vault storage is just one part of your overall backup solution, but it is one of the most important parts. Do you have a Backup System in Place? Take the time today to consider the backup procedures you have in place for your business. It only takes a few minutes to wipe out everything that you have built up over the years. Your files and all of your media need to be backed up in a different location from your business. This will allow you to access the information and to continue operating your business after a disaster. As the Internet, the cloud and other data storage solutions have entered the field, it is still important to have your most important documents and files in a media vault. This will give you additional protection and allow you to access the files to rebuild your client list or restore your computers after they have crashed. As you review your current system, you may find it more cost effective to move to a digital filing system, and to create a digital back up to store in your media vault. This can save you money and space. Looking for a Backup Tape Rotation and/or Media Vaulting Service? 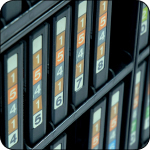 At Record Nations, we take all the hassle out of finding a tape vaulting service that works for your company. We will help you figure out what you’re looking for and put you in touch with secure local tape storage and vaulting experts, and make sure that you have the access you need to retrieve a backup tap if you need it. Getting a quote is quick and easy! To get started, fill out the form to the right, or give us a call at (866) 385-3706. Within the next few minutes, you will be contacted by up to four tape rotation and storage experts who can assist you.